When freight shipping has no required delivery time, and can afford a longer transit, rail shipping is a cost-effective way for businesses to positively impact their bottom line. Although reducing freight costs with rail shipping does not make sense for all logistical situations businesses are often able to save big when using rail for long-distance shipping. Not only is rail shipping able to significantly reduce costs but, it is more environmentally friendly and reliable than most other shipping methods. For a reliable and cost-effective shipping method that has a lower carbon footprint than most C&D Logistics recommends rail shipping. One of the major challenges that Canadian businesses could be facing in the near future is a shortage of truck drivers. With a smaller supply of truck drivers available for shipping and logistics services this could cause a fluctuation in prices, and force businesses to rely more heavily upon other modes of transportation such as rail shipping. Although rail shipping isn’t as fast as truck or air it is less expensive and equally as reliable. Reducing freight costs with rail shipping is a great option for businesses that are in need of affordable, long-distance shipping solutions. Not only is rail shipping far more fuel-efficient than other transportation methods it provides customers with a variety of affordable container options for shipments of all sizes. If your business is considering a reduction in freight costs by adopting rail shipping talk to the experts at C&D Logistics first. Not only is rail shipping an affordable shipping solution for many businesses it is one of the most reliable shipping solutions. Extreme weather conditions can negatively impact arrival times with truck, air, and sea shipping. This can result in shipments being delayed for days at a time which can be costly for businesses. Fortunately rail shipping is rarely affected by extreme weather circumstances and usually remains on schedule. For shipments that aren’t heavily constrained by time limitations rail shipping is a reliable and affordable solution. 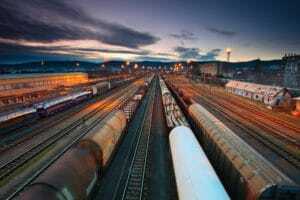 As previously mentioned rail shipping is the most fuel efficient shipping method for businesses. Because of its fuel efficiency it has less of an environmental impact than other modes of transportation; especially those on land. Businesses can significantly reduce their CO2 emissions and carbon footprint by using rail shipping. Rail transportation also sees far fewer accidents than other methods. Talk to C&D Logistics about how your business can reduce its carbon footprint through rail shipping. For more on reducing freight costs with rail shipping contact the shipping and logistics experts at C&D Logistics. For a free quote: please visit our website our call us at 604-881-4440. C&D Logistics offers a variety of different specialized freight-shipping services and logistics services including rail shipping, full truckload, and less-than-truckload. For the past 15 years our team has helped provide small, medium, and large businesses with a reliable, cost-effective way to move freight. Stay up-to-date with the latest shipping news by subscribing to our newsletters and following us on Facebook.